This gives us one helpful way of framing how Carroll’s commentary fits into the ongoing stream of scholarship on Luke: while some commentaries devote most of their pages to reconstructing the historical world behind the text, and others delve most deeply into the twists and turns of interpretation history that have developed in front of the text, Carroll focuses his critical efforts on narrative analysis on the nuances of meaning in the text itself (9). Carroll is far from alone when he says this. Other writers have also made note of the emphasis on social critique, reversal, and concern for the vulnerable in Luke’s Gospel, including the Protestant theologian Joel Green in The Theology of the Gospel of Luke (1995) and the Catholic scholar Joseph Fitzmeyer in his series of lectures, Luke the Theologian (1989). 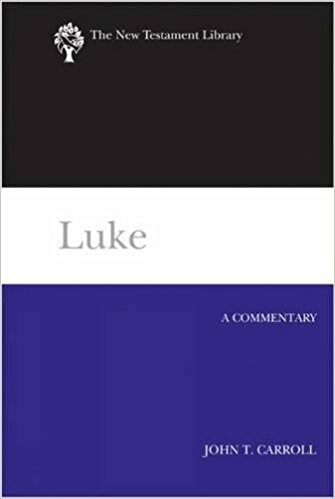 But Carroll writes on this aspect with both clarity and nuance, making him a useful companion for those using this commentary to become familiar with Luke’s Gospel for the first time. In some ways, I think it may be that Luke’s overarching approach reflects a strategy for persuading the surrounding Roman world that early Christians didn’t need to be persecuted or vilified as a dangerous threat. It may also be part of Luke’s relative openness to Gentile inclusion in the young Christian movement. To once again complicate things, though, we do well to keep in mind that all of Luke-Acts takes place under the shadow of the Empire, with first Jesus in the Gospel and then Paul in Acts coming into grave conflict with the authorities (399-400). Clearly this is a complex interpretive question. While Carroll provides no easy answers, he does orient readers to the various ways contemporary scholars have approached these questions, and I think he does help his audience begin to notice the ways in which Luke seemingly critiques the exploitative socioeconomic aspects of the Empire in his narrative without stepping into open confrontation with it. These are just a few of the interpretive topics Carroll explores, but hopefully they demonstrate his way of using a literary approach and keeping an eye out for social dimensions of Luke’s Gospel to bring out layers in the text that may otherwise be missed. Luke’s Gospel can arguably be seen as the most linguistically crafted of the canonical gospel accounts. And his attentiveness to the stories Jesus told while on the way to Jerusalem is also distinctive. It is Luke, Eugene Peterson suggests, who “immerses us in the way Jesus uses language as he deals with the ordinary and the occasional” (2008, 17). For a Gospel of this sort, there is much to be gained by paying attention to its literary contours, and with a satisfying amount of scholarly rigor, Carroll takes on this task, and his commentary comes out the better for it. By shedding light on Luke’s use of language and story, Carroll deepens the experience of those who use his commentary as a reading companion, and for this I am certainly grateful. Fitzmyer, Joseph A. Luke the Theologian: Aspects of his Teaching. Mahwah, NJ: Paulist Press, 1989. Peterson, Eugene. Tell it Slant: A Conversation on the Language of Jesus in his Stories and Prayers. Grand Rapids, MI: Wm. B. Eerdmans Publishing Co., 2008. This entry was posted in Book Reviews and tagged Book Reviews, gospels, luke, narrative theology, New Testament, theology by joecrow91. Bookmark the permalink.